The magnifier is on a flexible neck that gives you 2.5X(6D) and 4X(12D) magnification. The 3 adjustable helping hands clips allow for precise positioning and secure grip on your work. 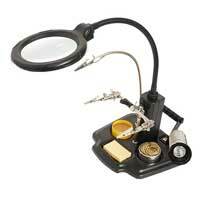 The magnifier is powered by either 4 AA batteries or external power adapter.